The Folger Shakespeare Library of Washington, D.C. sent copies of the First Folio of William Shakespeare’s plays on a 50-state exhibition in celebration of the 400th anniversary of the bard’s death in 1616. The First Folio is the only reliable record we have of 18 of Shakespeare’s plays. The exhibit is at the University of Iowa Libraries until Sept. 25. I first heard of the First Folio in Father Harasyn’s freshman high school English class in 1966 when we read and memorized parts of The Merchant of Venice. I can still hear the voices of friends who went to work in quarries, at construction sites, and driving trucks reciting Portia’s quality of mercy speech from memory. It was the deepest dive into a single Shakespearean play I’ve had. May mercy fall like gentle raindrops from heaven on the graves of my departed childhood friends. I’m not hopeful of getting to the county seat to view the exhibit. 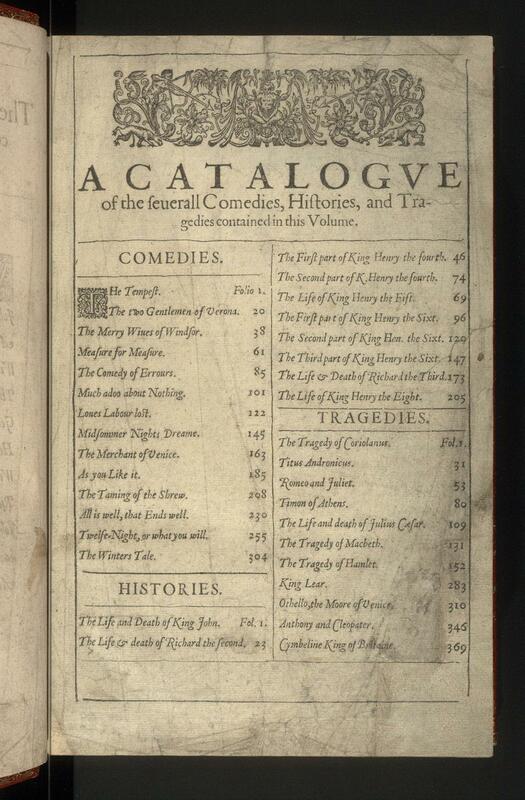 Let’s face it, First Folio is not that rare and is one of the most cited texts on earth. It’s commonplace. I viewed a copy at the Library of Congress where it was displayed near their copy of a Gutenberg Bible, a much rarer document. Of roughly 500-750 copies believed to have been printed in 1623, about 234 are known to have survived. The printing process was “revise as we go,” which yielded many variants. 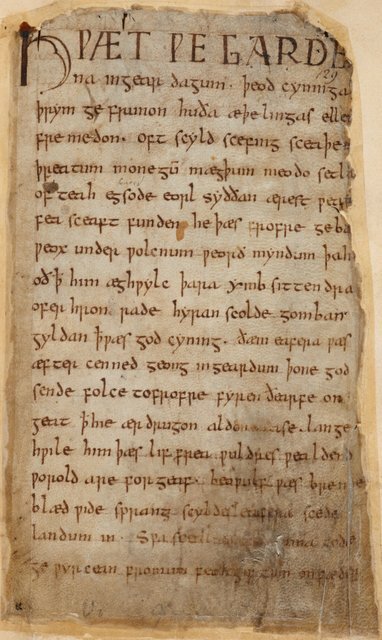 When we think of a literary tradition that includes Homer, Sophocles, Euripides, Aeschylus, Aristophanes, the Gutenberg Bible and the Beowulf poet, 234 extant copies is a lot. The First Folio is no Beowulf in terms of rarity of manuscript copies. Me: Have you seen the First Folio? She: No, not yet. My professor said it’s not that special. Why would he say that? Me: Cancel his tenure, fire him, and get him to work digging ditches. She: Yes. An apology would suffice. I took an undergraduate Shakespeare course from the late Sven Magnus Armens at the University of Iowa. Born in 1921 to Swedish immigrants in Cambridge, Mass., Armens was a Tufts and Harvard graduate who served in the Coast Guard during World War II. His papers are located in the University Library Special Collections Department and of more interest to me than the traveling First Folio exhibit. I haven’t seen them either. Known for walking his Great Danes around Iowa City, Armens was a chain smoker and smoked during our class. His hands were stained with tobacco and his classroom notes yellowed with age. By the time I took his course, he’d been at Iowa 20 years. We knew class was over when he crumpled his empty cigarette pack and threw it in the corner waste basket. A Shakespeare class seemed obligatory for an English major. Armens filled a slot and seemed delayed from life outside the classroom as he took us through several plays. His physical presence was as important as the texts we studied. If we view the world through the window of Shakespeare’s plays, as Erving Goffman has suggested in The Presentation of Self in Everyday Life, the First Folio is important. Perhaps because of the way western society came up, Shakespeare has been ingrained in our lives like few other literary works. If some are dismissive of First Folio, one concedes there are other, Shakespeare-less, world literary traditions. It is hard to escape the grip Shakespeare has on our lives 400 years after his death. Whether to view the First Folio exhibit, or not to view, has become surrogate for the struggle to transcend our roots and see the world in a different way. That is so Shakespearean and perhaps why I’m torn. The act of viewing would be a concession to Shakespeare preeminence, something for which I’m not ready. The book will be opened to Hamlet’s speech, “To be, or not to be,” so maybe I should just get over it and go. This entry was posted in Writing and tagged William Shakespeare, Writing. Bookmark the permalink.